This nicely furnished, spacious and comfortable villa is set in 1-ha large grounds and consists of 2 parts that, if rented in their entirety, are suitable for up to 12 guests. The 40-m2 studio which sleeps 4 consists of one room with a bed, a dining table and a kitchenette, a bathroom, toilet and a bedroom with bunk beds. The main house has an area of around 220 m2 and features two kitchens, a large living room, a large, separate dining room, three bedrooms on the ground floor and one bedroom on the first floor. There are large patio doors opening out onto the various terraces that surround the house. 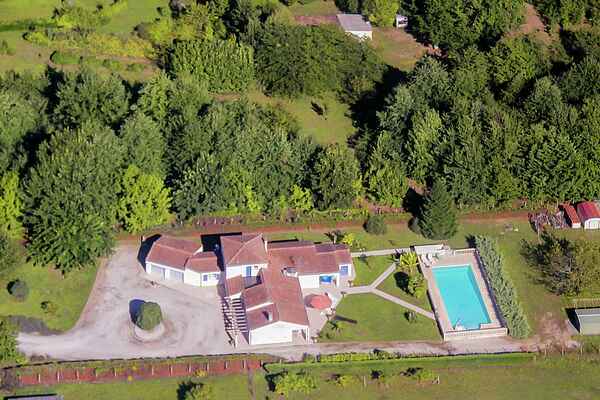 You can also make use of a second garden, which is across the street and borders immediately on the Dordogne. The gardens are beautifully landscaped and filled with lavender and palm trees. There's a saltwater swimming pool (skin-friendly), which is open from may until september. The perfect place to spend your holidays in style together with your friends or family! Sainte Foy La Grande is situated in the "Pays Foyen" and is encircled by three borders departments: Gironde, Dordogne ,and Lot et Garonne. This region is an excellent place to visit. There are a lot of sites and places of interest and a lot of things to do: day trips to discover the region, sports, leisure, local events and gastronomy. Sainte-Foy-la-Grande is a charming, colorful town founded in 1225 by Alphonse de Poitiers. Its lanes, half-timbered houses and town squar encircled by picturesque archways offer an exceptional asset for this town. The region is often called "Gateway to the Perigord" as many visitors use it as a base from which to plan their stay in Dordogne. The tourist is offered a superb choice of attractions many of which are distinctive to this corner of South West France. The region is a great getaway for the whole family because there’s so much to do for kids and grown-ups alike. Enjoy cultural and artistic activities, take a river tour or a nature hike, go fishing or play your favorite sport… The fun never stops! The region offers anglers a host of rivers, waterways and lakes. We’re sure you will discover your own ideal spot for a peaceful day’s fishing. Opportunities for swimming and water sports range from the large Lac de Gurçon to the swimming pools of the AquaPark at Bergerac.